Is the European North-South divide a consequence of a different mentality, where one implies fiscal profligacy, an intuitively lazier workforce and an incentive to cheat, while the other implies the opposite? Is the peripheral eurozone a ‘victim’ of its culture or geographical position (amid Ireland) that makes the Southerners work less and live ‘easier’? No. Culture, mentality and even the Mediterranean climate have nothing to do with the deep problems and divides Europe is facing at the moment. Other factors like the establishment of the euro exploiting the CA deficits, the paradoxical banking regulations leading to an equal risk and low interest rates for all countries making borrowing easier, and finally outside contagion that ceased the intra-regional transfers from the ‘rich’ North to the ‘poor’ periphery are much more liable for eurozone’s sovereign debt crisis. As for the structural imbalances like the competitiveness of the labour force or the stifling bureaucracy - now these can be explained through other factors. Primarily through institutional differences. These can be traced historically all the way to the Middle Ages, but a more modern approach has been applied by the recent report of Transparency International measuring the relative levels of corruption among EU members. 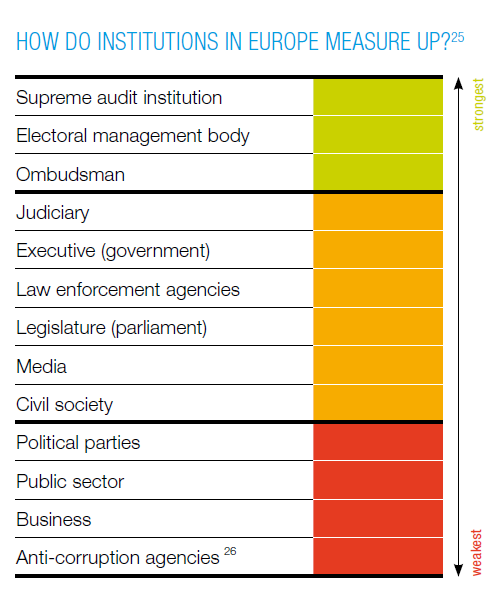 Source: "Money, Politics, Power: Corruption Risks in Europe"
"It comes as little surprise to learn from Transparency International that corruption is least extensive in Denmark, Norway (non-EU but mighty rich) and Sweden. The EU’s worst problems are to be found in Greece, Italy, Portugal and Spain (in the eurozone), and Bulgaria and Romania (outside it). More disturbing is the report’s contention that the Czech Republic, Hungary and Slovakia are displaying signs of a rollback of anti-corruption efforts since they joined the EU in 2004. In Slovenia, meanwhile, a remarkably high 93 per cent of respondents in a recent opinion poll thought that corruption in their country had either increased or stayed at the same level over the past three years. The report makes a good point when it says that, even in rich countries, there is often a close connection between unpunished corruption and disorderly public finances. Greece is Europe’s supreme example. But can one construct the same case for the UK’s parliamentary expenses scandal and its extremely high budget deficit? Transparency International doesn’t try to make this argument, but maybe some of this blog’s readers would beg to differ." One should be careful in assessing the causal effect in corruption being the cause of structural imbalances within Europe. However, the correlation between high corruption and peripheral troubles somewhat induced by fiscal profligacy is astonishing (search the report for individual institutional failures like the public sector, political parties or the media). Even though causality is left to be proven, one cannot shake the idea that differing types of institutions determine the different levels of corruption and consequently lead to worse-off outcomes. All of the PIIGS are near the bottom of the corruption list. And the problem with corruption isn’t new, it started a long time ago. Can we conclude it is embedded in the mentality of some peripheral nations? Perhaps corruption can be used as a proxy to measure differences between institutions in Europe. A similar methodology was applied by Acemoglu, Johnson and Robinson (2007) in their paper “Colonial Origins of Comparative Development”. They use settler mortality as a proxy to measure institutional differences in colonies. The idea is that more settlers died in countries with poor institutions as they weren't able to adapt to the new area. In colonies in which settler mortality was low, they ended up being rich and prosperous, meaning that a proper set of institutions ensured this transition. The paper is an excellent example of instrumental variable regression. I recommend it in that perspective. So can the same methodology be applied to corruption to prove institutional failure? Perhaps. In order to do so, we must operate under similar assumptions on what affects institutional change and how existing institutions affect other outcomes and determine future changes in behaviour. When you think about culture or mentality as the reasons for change, think about the impact different institutional settings have on the formation of culture, mentality or identity. For example, generations of Americans were born in one institutional environment which influenced their culture and their mentality. On the contrary the Chinese for example were born and brought up in another institutional environment affecting their cultural development in a different way. One can say that these two factors interlink – those born in a certain environment tend to (and in good environments have an incentive to) preserve it. This is what generates a positive feedback loop that ensures that the society built on a proper institutional setting will evolve and generate more freedom and more prosperity (Acemoglu and Robinson, 2012 call it the virtuous cycle – examples include the Civil Rights Movement in the American South in the 1960s, busting up the trusts in the 1910s and even Roosevelt’s failed attempts to control the Supreme Court). A similar institutional dynamic was set forward in Great Britain and most other currently successful nations. The problem with empirically proving causality in this case is how to accurately measure corruption? Using an index may lead to possible bias. Settler mortality was easier since the data is clear. Measurements of corruption are subject to differing definitions of what corruption is and how it manifests itself. Even if a credible institution like Transparency International provides the data, this still might not be the best way to start conducting an econometric research (perhaps a weighted index of corruption from different sources can go beyond the measurement error). Nevertheless, it’s still a very interesting topic to think about. I would say that corruption can provide a very good explanation on why PIGS are in such a distress. But then again, I agree with the FT - isn't the same case applicable to Britain as well? I mean, with the Leveson inquiry, we're finding out about all these stories on media interference with high politics (of which we were always sceptical about but could never put a finger on it). I doubt that the US are any better in that perspective. In my opinion the increasing corruption extends far beyond the PIGS. Britain and the US are prime examples of this deteriorating attitude. What’s behind Iceland’s rapid recovery?